Black is most certainly back, and you can make sure you have this season's must-have colour in your kitchen when you select one of our black sink taps. Black and silver were popular colours for the living room not too long ago, and now designers are bringing chrome, silver, and black into the heart of the home, the kitchen. HC Supplies bring you the most elegant and contemporary styles from some of the UK's most reputable black kitchen taps designers. Browse our divine designs in the black taps collection from Astracast and Rangemaster today. Everybody loves a bargain, and when you shop online at our black taps kitchen sale, you can expect up to 30% off the recommended retail price. If you like the thought of a little black adding some drama to your taps, feast your eyes on the Astracast Tybers Volcano black tap which features an attractive black facade and curved chrome tap.For full on black, choose the Finesse black stainless steel tap from Astracast. For kitchen taps black is most certainly this season's colour, so go ahead and give in to the dark side. We specialise in cut price black taps kitchen accessories from high end designers. When homeowners need reliable and stylish taps, they come to HC Supplies. Allow our friendly advisers to help you choose the ideal black taps for your kitchen, and bring modern elements into your home. We can assist with a complete redesign, or just those important touches needed to refresh the look of your kitchen. Give our friendly customers services team a call, or write to us online using the contact form, completing your details and requirements, and the nature of your query. We realise how exciting it can be to know precisely how you want your new kitchen to look, and we also realise ho frustrating it can be not to have everything you need to complete your refurbishment. This is why we are dedicated to making sure your purchases get toyour address on time. Once you have made your purchase, you can expext your items to arrive within 2 to 7 working days, and we can even arrange for your black taps to be delivered on a date that suits your schedule. HC Supplies also delivers to homes outside the UK, and are happy to transport your goods overseas. To make sure you get your taps when you need them, call to speak with an adviser, and let us know how we can help. Still unsure about what design you want in your kitchen? Why not be inspired by our displays at the Doncaster showroom, and see for yourself how your kitchen could look? 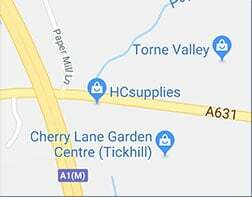 If you can't make it down to our showroom, you can of course find all our products online, complete with recommendations for any extra items you may require, such as sinks and worktops. Save money, and time, when you shop online at HC Supplies.